The Kutcher Foundation establishes the John Simpers Baseball Service Award for the Harford County, MD baseball community. John Simpers exemplified service to his community through his leadership and support of the amateur baseball umpire associations he helped organize, lead, and sustain for nearly 5 decades. John’s service was instrumental in establishing a top tier high school umpiring program, including the recruiting, training, scheduling, and management for our county’s youth as well as the famed Susquehanna League. His love of the game translated in a desire for every player to have a positive experience, from the starting shortstop to the bench player hoping to get on the field. John went the extra mile to make a difference in the lives and experiences of those around him, through his passion for baseball, softball, and umpiring; and to the young players competing on the field. Each year, at the HMBL spring event, a recipient who exemplifies John’s commitment to service to Harford County’s amateur baseball community will be recognized, and provided a stipend to help support their service. John Simpers was a model for service to our community and the advancement of youth, High School, and Adult baseball officiating programs that helped elevate the caliber of competition and collegiality among all participants. He worked tirelessly to sustain high quality organizations and was always willing to give advice and direction to his many proteges for over forty years. Donations may be made to the Kutcher Foundation to support and expand The John Simpers Baseball Service Award. 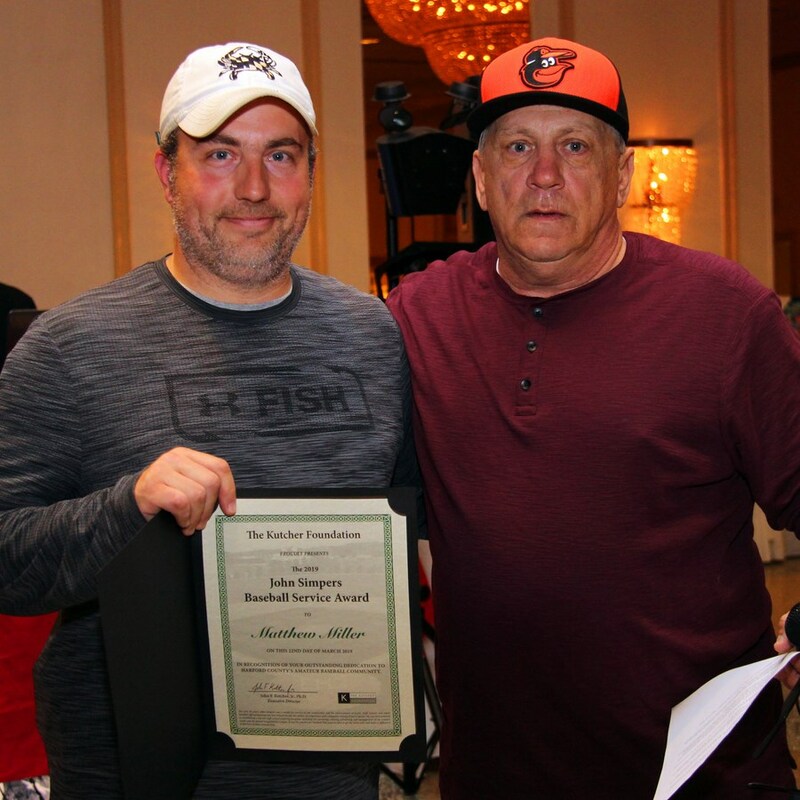 In 2018, the Kutcher Foundation [Founded by John Kutcher] established the John Simpers Baseball Service Award for the Harford County Maryland baseball community. The receiptant of this award is recognized for their tireless effort and dedication that are given day-in and day-out on behalf of the numerous baseball programs throughout the county. The first ever John Simpers Baseball Service Award winner was awarded to Mr. Robert Riale in 2018. To help carry on the legacy of nearly five decades set forth by John Simpers, Mr. Riale has graciously selected a new and upcoming umpire to receive a full set of umpiring gear that will allow this individual to begin his journey into the field of umpiring in and around Harford County. Please congrate Joe Mundo of Edgewood Maryland on being selected in 2019 and receiving the full set of gear. Joe is currently a freshman at Harford Technical High School and is enrolled in the Auto Collision Repair Program. Joe loves the game of baseball and has been playing it since the age of 8. His favorite positions are Shortstop, Left Field and Right Field and is currently attending try-outs for the Cobra’s baseball team. Joe’s deeper asperations are to develop his skills and learn the craft of becoming an umpire and looks forward to the day where he can umpire a game at the Ripken Experience in Aberdeen Maryland. Joe was shocked, thrilled and thankful to be recognized for his asperations and cannot wait to try on his new gear!